“NITOR” has let the cat out of the bag – I mean about my trying one of the Trophy team B.M.W.s immediatly after the “International,” and also one of the Jawas with their torsion springing. The invitation to ride the B.M.W. was a dual one. The team manager, Herr von Rücker, of the B.M.W. experimental department, asked whether I would like to try the Trophy-type machine, and would I see whether Mr. Turner would care to do so, too. And Mr. Turner, as you know, is a rival manufacturer – a British manufacturer and the managing director of Triumphs. You might expect that B.M.W.s would not want him even to look at the machine, let alone ride it and thus find out from personal experience exactly what it is like. Encountering folk with such a broad-minded, friendly outlook is pleasant indeed. Needless to say, we both accepted the invitation, and on the Sunday morning we took it in turns to rid the machine on which Meier, after the first few laps, headed the Trophy team race at Donington. Herr Rücker started the machine. It had “hot” plugs in it – plugs inserted for the speed test – and for a minute or two there was much spitting back and banging. Unfortunately, no roadster plugs were handy. However, Herr Rücker set off up the road. 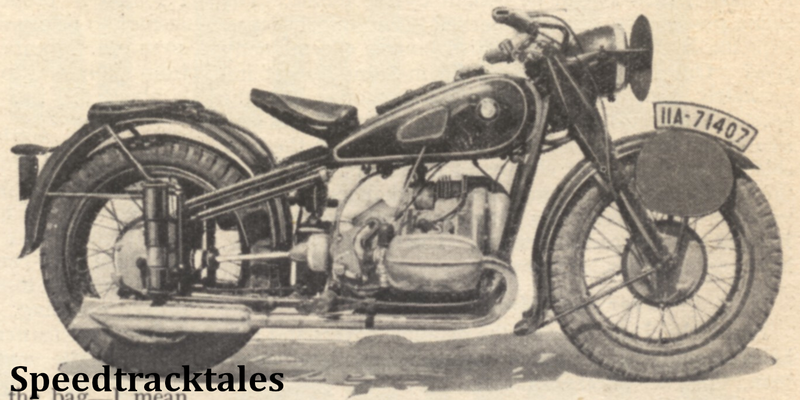 When he came back, the engine was firing fairly regularly at low speeds, in spite of the unsuitable plugs. The brakes he warned us about – they could not be adjusted any farther; they were in need of relining, which makes one realise what a masterly show Meier put up at Donington. Off I set on the famous shaft-drive transverse twin. As regards the handling, it was exactly like a standard R5 model, such as can be bought by the public. The riding position, as I have remarked before in connection with the R5, is typically British, and is exceptionally good. One feels at one with the machine almost immediately, except perhaps for the gear change. On the special Trophy jobs there is a hand change on the off side of the tank coupled with a foot change on the near side. I used the foot change as a rule, but also tried the hand change. Making clean-cut change in an upward direction involved a little care, and once or twice I found an unexpected neutral. The chang was light, howewer. and the clutch sweet. Purposely, I ran over all the manhole covers and potholes I could see. I wanted to test that can’t-be-bought item, the rear-wheel springing, which, as you know, even Jock West did not have until the last day of T.T. practice. About the only comment that can be made concerning the rear springing is that one does not realise that it is there! This, I consider, is just about the highest praise one can give a spring frame. .
Perhaps I had better add to this statement, because some may ask, ” Well, if you don’t notice it, what’s the good of having a spring frame?” The point is that a good spring frame does its job without making its presence apparent – you are not bounced up and down and you don’t find the tail of the machine waggling like a jelly. Instead, the machine handles absolutely normally except that the rear wheel keeps on the ground and rough roads seem smooth. In mv case I went over roads which, later, I traversed on a machine that has a rigid frame. Then, and only then, did I realise how rough some of the surfaces actually are. Having a more than passing interest in spring frames and spring-frame design, I mentally compared the B.M.W. with various other spring frames I have ridden. It struck me that in “feel” the one that is most similar is that of the T. T. Norton. This one might expect, for they are similar in their general idea, and both have a total range of movement, counting the upward and downward directions, of approximately 2½¡n . What pleased me immensely about the B.M.W. (as it has done with the production R5 model) was the saddle, which has a single tension spring mounted underneath. This is a revelation in comfort, and has no tendency to sway sideways, which is an important factor in saddle design, because one so largely controls a solo with one’s legs and thighs. I was not out to try the engine, because I have a fair amount of previous experience with B.M.W. engines. This one was chiefly notable for its special water-excluding devices and its unusual finning of the cylinder barrels arrangement which B.M.W.s have recently patented and were trying out. Roughly speaking, the fins may be said to take the form of triangles with the cylinders as their base, and with the triangles on adjacent fins staggered so that the air blast can do its job. The cylinders looked like light-alloy ones, but I was told that they were cast-iron, cadmium-plated. One thing I must add about the engine was how, as usual with B.M:W.s – in fact, with nearly all multis- I found it propelled the machine much faster than seemed to be the case. Look down at the speedo when 40 m.p.h. appears to be the speed, do mental gymnastics from kilometres to miles, and one finds the actual speed is about fifty! The “hot ” plugs gave a false idea of the behaviour of the engine at low speeds. I gather that before the trial started the maximum of the solos was 95 m.p.h. with their 6½ to 1 compression ratio. They might have run them with compression ratios up to 8 to I , but decided to keep them on the low side in case the course proved gruelling. 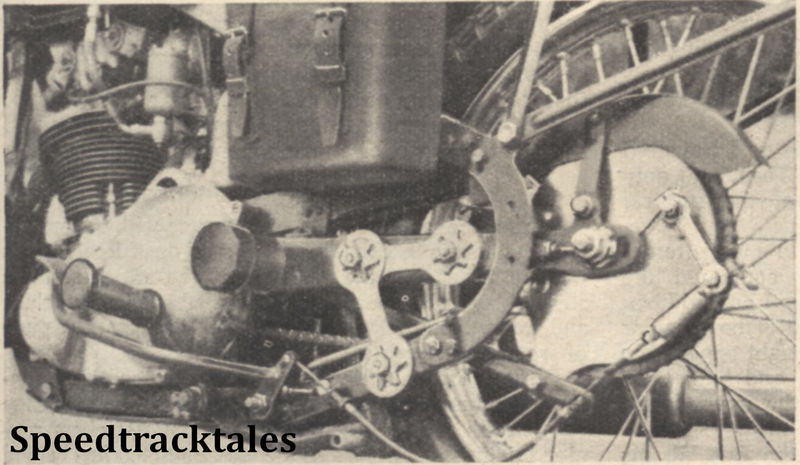 One final matter before we pass on to the ]awa : the fact that the engine was mounted transversely in the frame was only apparent at very low engine speed ; in ordinary touring or fastish road work there was nothing to tell which way the engine was mounted, and the machine swung round bends to perfection. The ]awa was exceptionally interesting because of the novel nature of the springing. So far as I am aware, torsion springing has never previously been employed. Of course, when one compresses a coil spring all one does is to twist the wire, but that is hardly what one calls “torsion” springing. The great features of the Jawa system are that there are no bearings to wear or get out of order, and the arrangement ensures exceptional-rigidity laterally. The system was applied to all three wheels in the case of the Jawa sidecar outfit and to the rear wheels of the solos. It was. being employed experimentally, and I hope that we shall be hearing more of it. 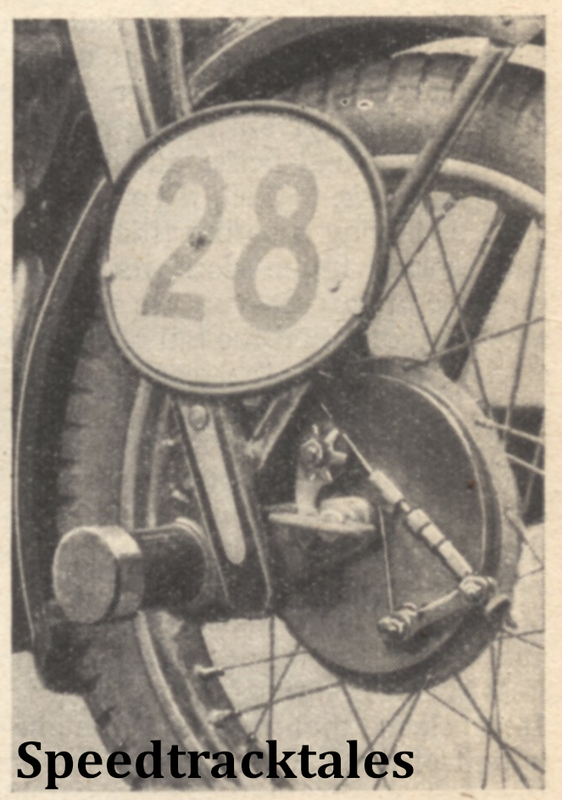 During the week nothing went wrong with the springing beyond the fact that a split clip on the sidecar chassis – there to enable the position of the wheel and the strength of the springing to be varied – tended to shift and was periodically loosened, knocked back with a piece of wood and retightened. Perhaps the system will be best understood if we consider for the moment the rear-wheel suspension. In the photograph will be seen two chainstay members running to a tube-shaped cross-member mounted just behind the gear box. This tubular housing contains flat steel plates arranged in the form of a star-fish. The plates are fixed to the chain-stay members at their outer ends and clamped rigidly to the frame at the middle. Thus, as the rear wheel hits a bump. the shock is taken by twisting the steel strips. The deflection of the strips for an inch movement at the wheel spindle is, of course, almost infinitesimal.